Four Warren Alpert medical students received Albert Schweitzer Fellowships for 2017-2018. The fellowship awards each student a $2,000 stipend to design and implement a community service project that addresses health disparities and the social determinants of health. Fellows must coordinate with community partners to identify unmet local health needs; plan sustainable projects that will continue after the fellowship ends; and evaluate the impact of their intervention. They will commit at least 200 hours to the project over the coming year, at least half of which are direct service with their client population. They’ll also attend monthly meetings to develop leadership and other skills and network with professionals and other students. The Schweitzer fellows from the Warren Alpert Medical School this year are Anna Delamerced ’16 ScM’20 MD’20, Hiba Dhanani ScM’19 MD’19, Bryan Leyva MD’18, and Peter Mattson ScM’20 MD’20. Read more about the students and their projects below. She saw a need at the assisted living facility in Warwick where she was paired with a resident last semester. “She mentioned she didn’t have family or friends in the area, and the holidays would sometimes get lonely for her. So I said, what can I do to help?” Delamerced says. Delamerced read journal articles about social isolation among the elderly and how it can affect their health. 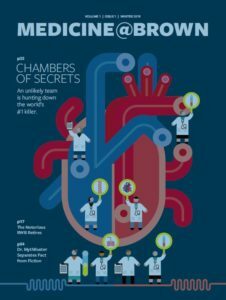 A writer and poet who led a medical journalism preclinical elective last year, she says the life stories that the facility resident told her inspired her fellowship project: to develop a workshop series at the Warwick facility that integrates creative writing, visual arts, and storytelling. As she developed her project proposal for the fellowship application, Delamerced worked with the assisted living facility directors as well her Doctoring small group leader, Elizabeth Toll, MD, clinical associate professor of pediatrics and of medicine; they will serve as her project mentors in the coming year. 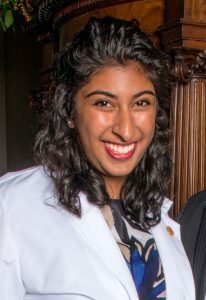 As a member of the inaugural class of the Primary Care-Population Medicine (PC-PM) Program, Hiba Dhanani MD’19 ScM’19 says she came to the Warren Alpert Medical School to become a provider-advocate. 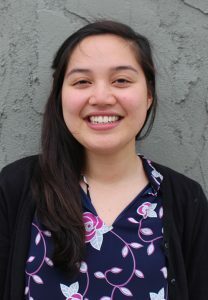 When designing her fellowship project, Dhanani thought back to her first-year Health Systems Science course, where she learned about the connection between asthma and housing. In Providence, she notes, asthma disproportionately affects children of color and refugee children, who are more likely to live in low-income housing. To address the problem, over the following year she will educate parents of children with asthma about possible triggers in their homes and the responsibilities of landlords and tenants to address them. Dhanani will work with the Rhode Island Medical-Legal Partnership, which is based at Hasbro Children’s Hospital, and the Rhode Island Department of Health to hold biweekly education sessions for parents at a community health center. Dhanani says the opportunities to effect change and to learn from peers from multiple disciplines attracted her to the Schweitzer Fellowship. Her project mentors are lawyers: Elizabeth Tobin-Tyler, JD, MA, an assistant professor of family medicine and a senior adviser with the National Center for Medical-Legal Partnership; and Jeannine Casselman, JD, a program manager at Medical-Legal Partnership Boston. She’ll also collaborate with local schools and asthma advocacy organizations so they can continue her work at the conclusion of her fellowship. 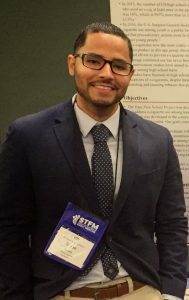 While working for the Center for Community-Based Research at the Dana-Farber Cancer Institute a few years ago, Bryan Leyva MD’18 coordinated a trial to establish evidence-based cancer prevention programs at Catholic parishes that serve Latino communities in Massachusetts. Their findings, published in the journal Translational Behavioral Medicine in June, with Leyva as lead author, suggested that faith-based organizations could be effective messengers for health care strategies among Latino and other immigrant groups. Churches have the infrastructure to maintain a health program, Leyva notes: meeting halls, members who work in medical fields, a spirit of altruism and volunteerism. This year he’ll help four churches in the Providence area build on those resources by helping to develop health ministries, or groups specifically created to promote health, and by offering training in motivational interviewing, a skill he learned as a first-year medical student. With this skill, he says, volunteers will be better equipped to help people quit smoking, control their blood pressure, improve their fitness or nutrition, even address depression and anxiety. Mental health issues are particularly prevalent among undocumented and other immigrants, but stigma prevents many from seeking help, Leyva says. “Churches can facilitate access for those who need services but may not get them,” including people who lack insurance, he says. Some kids want to become doctors because they love science, or they went on a cool tour of an anatomy lab, or they learned CPR. But others are inspired by less traditional medical careers: health policy, population medicine, medical design. Peter Mattson MD’20 ScM’20 places himself in the latter group. “I was exposed to public health—how systems could be improved and strengthened on a larger scale,” he says. 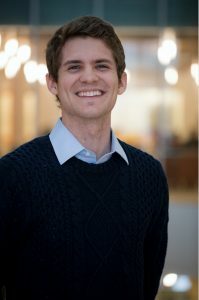 A student in the Primary Care-Population Medicine (PC-PM) Program, Mattson volunteers with Pathways, which he says uses a “traditional approach” to introduce underrepresented students to medical and other science fields. But this year he is recruiting teens who might be attracted to medicine as a result of untraditional interests and experiences. For his Schweitzer Fellowship project, he designed HealthCORE, a course that will expose local underrepresented students to some of the other opportunities in health care. Mattson designed a 10-class curriculum that he will offer to 24 students this summer. He’ll enlist professionals as guest speakers, offer electives tailored to students’ interests, and mentor them individually. By the end of the program he hopes at least three-quarters of them will demonstrate increased interest by participating in optional health care opportunities over the upcoming academic year.